As I write this (just before 3 a.m.) about a thousand LAPD officers are removing Occupy Los Angeles from their camp surrounding City Hall. We knew the eviction would happen eventually. Occupy LA are people protesting that 1% of us have too much wealth, about 33% of it. The 1% want Los Angeles to open for business normally in the morning. I'm sure they will get what they want. The top 1% of composers control 99% of orchestral concert programs. The composers shown are Haydn, Mozart, Beethoven, Mendelsshon, Brahms, Tchaikovsky, Mahler, Ravel, Debussy, Bartok, Stravinsky and Shostakovich. It's a clever idea. There's no question that the symphonic repertoire favors a chosen few. A few composers are performed repeatedly and outsiders have a hard time getting heard in concert halls. Still, you've got to wonder about this 99% statistic. Can the real numbers truly be that lopsided? I decided to take an educated guess. A website called Instant Encore posted a list of the top 150 composers, by frequency of performance, during 2010. They say the data represents over 42,000 concerts worldwide, including opera. 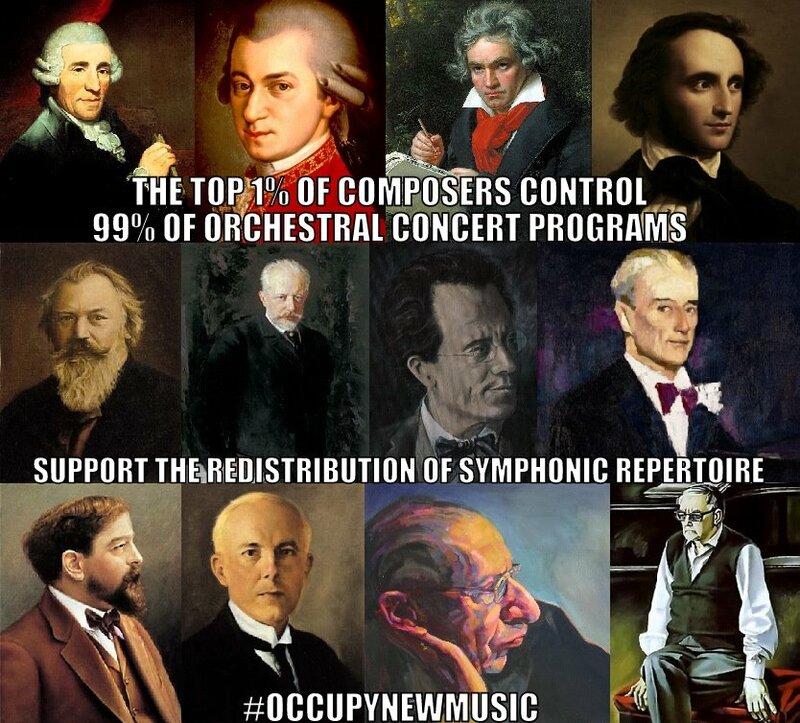 This is a bit different in scope than the assertion of the Occupy New Music graphic which seems to exclude opera. What the heck - let's run with it. All 150 composers get a total of 44,279 performances. Number one is Mozart, at over 3000, down to Luciano Berio in the coveted 150th spot with 43 performances. One percent of 150 composers is one and a half composers: Mozart (3035) plus half of Beethoven (2859/2 = 1430) is 4465 performances. That's a smidgen more than 10% - nowhere near 99%. Let's extrapolate. The top 10 get 16,899 performances between them. That leaves the other 140 with 27,380 - for an average of 195 performances per composer. To compare the top 10 composers on Instant Encore's list, I'd need data for 850 more composers. That's because 10 is 1% of 1000. I'm going to take a guess at the average number of performances for composers 151 through 1000. I guess 20 (about 1/10 of 195): 850 x 20 = 17,000. All 1000 composers thereby get 44,279 + 17,000 = 61,279 performances. This means that the top 1% of 1000 composers get 16,899/61,279 of the total. That's 27.6% - a far cry from 99%. Further extrapolation: suppose the composers ranked from 1001 through 100,000 get an average of 2 performances each (one tenth of 20). That's 99,000 x 2 = 198,000 performances. Now the top 100,000 composers get a total of 259,279 performances. In this scenario the top 1% of them (1000 composers in this scenario) usurp only 23.6% of all performances. If composers 1001 through 100,000 get an average of one performance each, the top 1% get 38.2%. If composers 1001 through 100,000 get an average of one tenth of a performance - meaning that fewer than 1 in 10 gets performed at all (very unlikely) - the percentage finally approaches the realms of Occupy New Music: 86.1%. If you love symphonic music enough to write your own music in that tradition, you need to accept the unfairness of reality. There's lots of other music worlds you could be living in rather than beating your head against an art form which pretty much defines the notion of "resistant to change." But the 150 composers did include, by my count, 18 names of living people - so you've still got a chance. Only 2 women. Just one black person (well, two if you think Beethoven was black). You've got a small chance. Very small - but it's a better chance than you have of winning a lottery jackpot. Instant Encore also listed the most frequently performed 225 classical works of 2010. The list includes just one piece by a living composer. You'll never guess, so I'll tell you: it's Jonathan Brielle's Nightmare Alley. Who? The Lifespan of Classical Music "I think classical music is quite dead. It's easy to overlook this fact because many people still enjoy listening to it." If Music Be The Food of Love "Hip Hop, as the magazine cover says, is not dead. However Hip Hop has recently discovered its own mortality." A New Rhapsody in Blue "It occurred to me that if many (or even a few) performances of classical music had this level of creativity in them - of even a small fraction of the creativity in this performance - I would not think of it as such a dead art form." Everybody Loves Beethoven (Probably) "it is probable that 98% of all Americans these days don't know any contemporary composers at all, and if they did - unlike in Mencken's hypothesis - their reaction to finding out about them would be the shrugging of shoulders and the changing of channels." Classical Music Isn't Dead, It Just Needs a Rest "I conclude that in such situations the music is not meant to offer a contemporary perspective. They have other forms of art for that. I fear this music is more like a spa treatment for ones ears." Could Terry Riley's In C be Accepted As Classical Music? 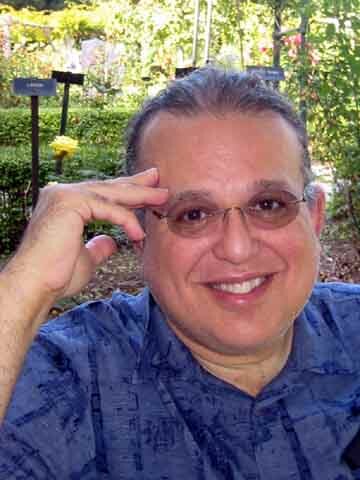 "Yes, getting this piece into the standard repertory is a long ways off. If it happened, In C would change from a "minimalist classic" into an actual piece of classical music. That would provide strong evidence that classical music has some life left in it." Ten Most Influential Classical Composers "But the real burden of Mozart for modern composers is that he was so blasted young. The cult of the young genius lives on strongly. These days a 30-year old composer who hasn't made it yet, won't." Glass is likely in the nation’s highest tax bracket, but there was a time he drove a taxi cab to support his music career. ... and soon others took the mike to call out statements like: "Tickets are for the 1%," "Revolution for the arts" and "Opera belongs to the people!" That's probably the biggest reason why I'm doing mostly computer music these days. While I love working with musicians, I'm kind of tired of being limited to solo or small chamber works. Not holding my breath for orchestras to play my stuff, either. Thanks for doing the math. Trying to hear "new" classical music in a large concert hall or on the radio or getting it performed (or heaven forbid reviewed) is so difficult it feels like 1%.In an odd way it makes me really realize how small 1% is. It's out there in abundance. It's just not in the traditional concert hall. It used to be in cassette culture. Now it is in creative commons culture. One good place to start is clinicalarchives.blogspot.com, which I have nothing to do with other than being a listener. www.archive.org is also a good place to find a lot of it. To get the new music of today you have to be in tune with how to be an audient of today, and it's not the way it was 100 years ago. Although most subscribers pay for what they know, when they are exposed to newer works that are good, and highlight some virtuosity or musicality, they love it. I've seen this first hand at a few concerts by the L.A. Phil and Peter Serkin's performances of Messian and Henze, played alongside Bruckner or Stravinsky. My take on new music is that people enjoy melody. Our caveman brains like hearing songs and stories around the campfire. The craziest science fiction film can be broken down to a story that anyone can understand, Star Wars is a basic hero's journey right from Greek theater. All of the composers you listed (except for Bartok and Mahler) created great, singable melodies. They found new ways to create them and present them, but the melody helps us identify with the piece. Melody seems antithetic to new music, like you can't create art with melody at the same time. But people want to hear that, which is why a John Williams concert sells out faster than John Cage ever will. Finally, composers today should get good at using samples. There's no excuse why you can't have a really convincing orchestral mockup of your piece to help get it commissioned. I know nothing about concert music, only film scoring, so I might be completely wrong on this. But at least you'll hear what it can sound like.